Detailed review of Zenwise Labs Probiotic. See how this probiotic supplement compares against all the others! Overall, at 2.5 out of 5 stars, Zenwise Labs Probiotic is an average probiotic supplement. It has some things that I like but also things I don’t like. I do like how affordable this probiotic is. It runs about $20 per bottle and can last you 2 months. I also like how easy and convenient it is to take. You only have to take 1 tablet per day, with or without food, and it doesn’t need to be refrigerated. The tablets are more natural and seem to be very allergy friendly and free of major allergens such as gluten, wheat, eggs, and soybeans. This probiotic seems to be intended for daily use. If that’s the case, it goes way overboard on the use of cells and probiotic strains. It has 15 billion cells and 10 different strains. More seems like it’d be better but it can actually lead to painful side effects and can even begin to cancel each other out or overrun the good bacteria. The bottle even suggests taking up to 3 tablets per day for extra support such as after taking a round of antibiotics. That would be 45 billion cells per day, which is just too many! These tablets aren’t safe for kids, they are meant for adults only. I also wish that I would’ve seen some more improvement while taking this probiotic. I didn’t see much if any relief from my digestive problems that come along with having Irritable Bowel Syndrome. That was a big bummer! Overall, at 2.5 out of 5 stars, Zenwise Labs Probiotic is an average probiotic because it’s affordable, convenient, and allergy friendly but goes overboard with cells and strains, isn’t safe for kids, and could potentially lead to side effects. 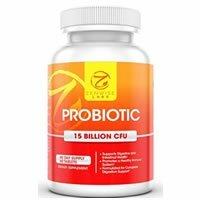 Zenwise Labs Probiotic has 15 billion CFU in 10 different probiotic strains. Of note, I like one particular probiotic strain that’s used – Lactobacillus acidophilus. This is a very well known and well-researched probiotic strain. Lactobacillus acidophilus may help alleviate symptoms of digestive disorders such as Irritable Bowel Syndrome (IBS) and Ulcerative Colitis. L. acidophilus may also help with gas, bloating, constipation, and potentially even vaginal infections. I also like the addition of the probiotic strain Bifidobacterium breve. This particular strain has been studied to show potential boosts in immunity and colon function. Bifidobacterium breve may be able to help lessen gas, bloating, constipation, and diarrhea. One strain I’m actually not a big fan of is Lactobacillus casei. Zenwise Labs Probiotic seems to be really allergy friendly. The tablets contain NO: eggs, fish, wheat, peanuts, tree nuts, soybeans, or gluten. I love when probiotics are allergy friendly for those of us with allergies and intolerances. The other ingredients used are: dicalcium phosphate, microcrystalline cellulose, stearic acid, magnesium stearate and silicon dioxide. For a bottle of 60 tablets, lasting 2 months, it costs $19.97. This works out to be only $0.33 per day to take this probiotic. That’s extremely affordable and much cheaper than the average probiotic. Although this isn’t my favorite probiotic supplement, I do think it’s a pretty good price for the value! I didn’t experience any negative side effects while taking Zenwise Labs Probiotic. However, side effects may be common for other people because this is a fairly potent probiotic. 15 billion cells and 10 different strains may lead to some belly cramping, pain, and/or bloating. So just keep this in mind, especially if you have a sensitive stomach! Zenwise Labs offers one of the best guarantees I’ve ever seen! They offer a 100% lifetime money back guarantee to all of their customers. What that means is that if you’re ever not fully satisfied with their products, they will refund your money at any time, no questions asked. I love when companies stand behind their products, so major kudos for such a fantastic guarantee. To buy Zenwise Labs Probiotic, click here.